Wonderful 14k White gold princess cut diamond engagement ring. Princess cut diamonds are invisible set in the center and appear larger, diamonds are also set either side of the center. Final touch to this ring are the channel set princess diamonds on the rings shank. Diamonds total 1 carat in this complete engagement ring. Stock size 7. We're happy to size this ring for you but sized items are considered custom, non returnable and wil add 4-5 additional days before shipping. Lovely 14k White gold curved halo design diamond engagement ring. 14k White gold engagment ring features include a beaded border throughout the ring. The heart of this design are seven prong set diamonds circled by a diamond halo. Diamonds total 1 carat. Engagement ring is complete. Beautiful 14k White gold diamond engagement ring. 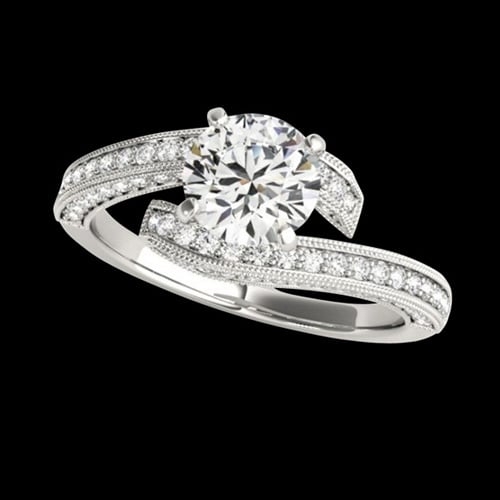 Our price shown is for the engagement ring set with .85ct tw diamonds in a stock size 6. Matching 14k white gold diamond band also available at an additional cost. Center design in this ring is created with six princess cut diamonds and surround with a rectangle diamond halo. The complimentary matching band is set with an additional .18ct tw round diamonds. You'll love this very affordable wedding set. We're happy to size this ring for you but sized items are considered custom, non returnable and wil add 4-5 additional days before shipping. Riveting Platinum halo design diamond engagement ring. Shown with the matching diamond band, our price is for the engagement ring minus the center stone. Also available in 14k yellow, rose, or white gold. Stylish design is set with 1/3ct tw round SI 2 clarity G-H color diamonds in a halo border around your center stone and either side in this engagement ring design. Center will hold a 3/4 or 1 carat round stone, use one of yours or search our incredible diamond data base for a top quality diamond. Matching band also available at additional cost and set with 1/4ct tw diamonds. Fiery Platinum diamond engagement semi mount ring. 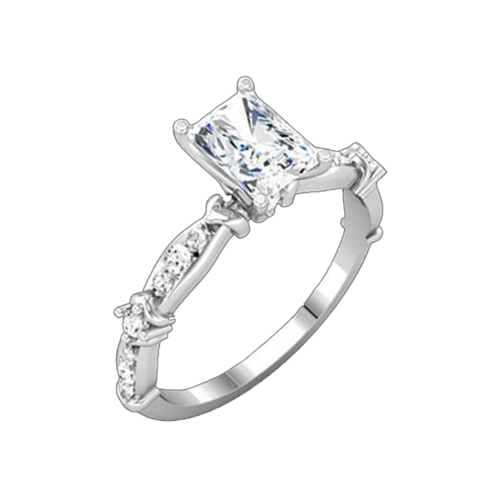 This bridal engagement ring features a split shank into prong design and can be set with a 1/2 to 1 1/2 carat center. Have your diamond set in this ring or find one from our incredible diamond data base or email for other gemstone pricing. Matching diamond band also available for an additional cost. Engagement ring also available in 14k yellow gold or Platinum. Diamond are SI 2 clarity G-H color and 72 round stones total 1/2 ct tw. Matching band also available at additional cost and set with 1/4ct tw diamonds. 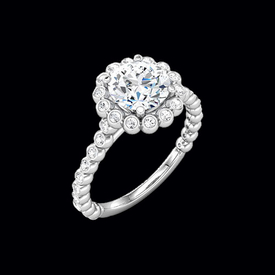 Striking 14k white gold diamond bridal. This diamond engagement ring is complete with the center stone and available in 14k white gold (shown), 14k yellow gold, or Platinum. The center diamond in this ring is a 1/2ct SI 2 diamond but can be upgraded. 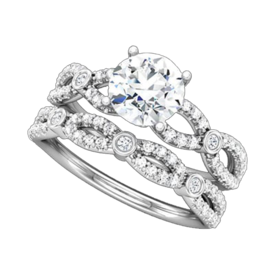 Additional diamonds set in this feminine design are SI 2 clarity G-I in color add 1/4ct for a 3/4ct total diamond weight. Perfectly matched diamond band available for an additional cost. 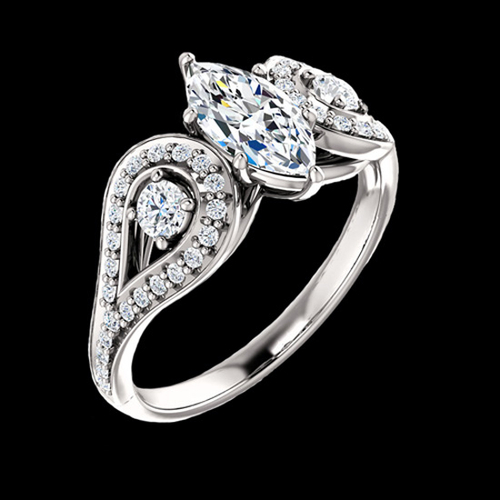 Enticing Platinum pave design diamond semi mount. Center round diamond is available in a variety of sizes from 5.2mm up a large 7.4mm round. Pave diamonds set either side of the center total 3/8ct tw. If you like the pave look you'll love this simple yet dazzling design. 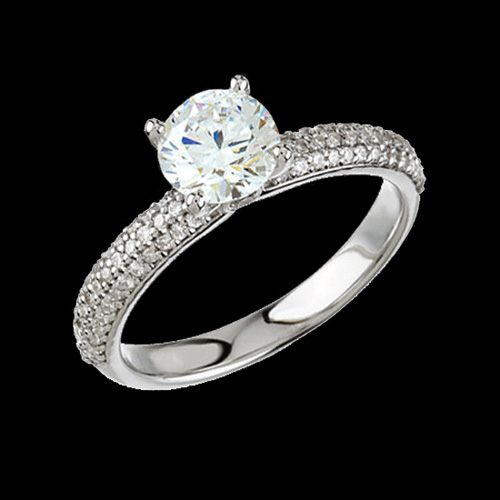 Use your diamond or check out diamond data base for a perfect diamond to fit this ring. Very stylish bridal diamond semi mount. Romantic Platinum Floral Halo design diamond semi mount. This incredible ring is set with 3/8ct tw round diamonds either side of the engagement band and the Halo design around a 5.2mm round center. Diamonds are SI 2 clarity G-H in color. This ring shown in Platinum, also available in 14k yellow gold, 14k white gold, and 18k gold's. Matching band diamonds total .07ct tw and is available at an additional cost. Lovely vintage inspired platinum 950 diamond semi-mount engagement ring. This incredible design is shown with a marquise center and can also be created with a round, square, asscher, cushion, emerald, or oval center. This engagement ring is available in a large variety of metals; Platinum (as shown), 14k yellow, white, rose gold and 18kt golds. Diamonds either side of the center stone total 3/8ct tw and the center. Center shown measures 9x4.5 but available in many different size options. This ring is really a design it your self style. Just email us with your center size or pick a great diamond from our diamond data base and we'll price it for you. 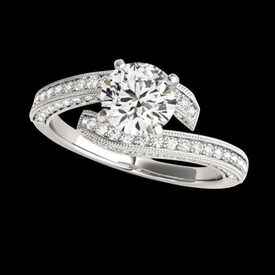 Price shown is set with 3/8ct tw SI 2 clarity G-H color diamonds not including the center. Charming floral engagement ring. This diamond engagement ring is complete with the center stone and available in 14k white gold (shown), 14k yellow gold, or Platinum. The center diamond in this ring is a 1/2ct SI2 diamond but can be upgraded. 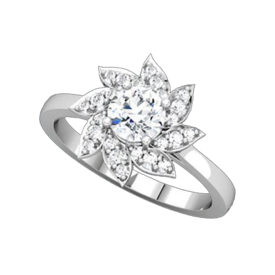 Additional diamonds set in the petals around the center in almost a petal halo add 1/6ct to the diamond weight for a diamond total of 5/8ct tw. If you have your own 1/2 carat diamond this ring can be ordered without the center. Vintage inspired Platinum diamond semi mount. This diamond semi mount will hold a radiant shape 7x5mm diamond and 1/5ct accent diamonds. Use our loose diamond data base to find you perfect diamond. Shoulders on this ring feature a romantic heart design. 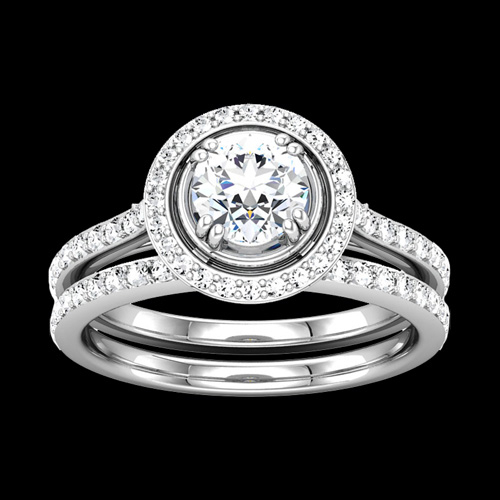 This design is available in 14k white gold, 14k yellow gold, and as shown Platinum. Matching band also available and is set with 1/5ct tw accent diamonds. Fabulous Platinum emerald shape diamond semi mount. Emerald shaped halo beautifully borders an emerald cut center (diamond not included). Use your diamond or check out diamond data base for a perfect diamond to fit this ring. Will hold a 7.5mm by 5.5mm or 3/4ct tw center. Split shank design is set with side accent diamonds and channel set shoulder accents. Diamonds are SI 2 clarity G-H in color. Very stylish bridal diamond semi mount. Platinum bezeled Halo style diamond engagement semi mount. 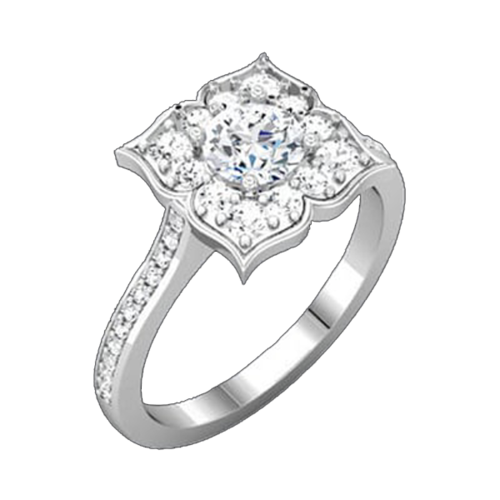 This unique bezeled halo design totals 1/4ct tw including diamonds along the shank either side of the center. Matching bezeled diamond band also available at an additional cost. Check our loose diamond data base for a perfect center diamond. Also available in 14k yellow or white gold. Stunning Emerald cut Halo diamond semi mount. 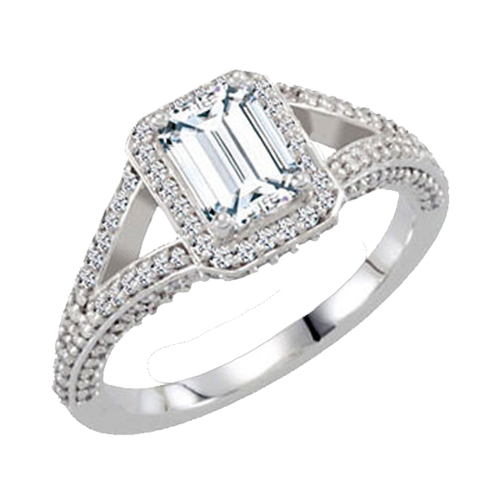 This Platinum split shank design diamond semi mount features a double halo around the center emerald cut diamond. (diamond not included) Center will hold a 7mm x 5mm Emerald cut diamond about 1ct. Diamonds in this Check out loose diamond data base for a perfect center stone or use one you have floating around. Diamonds are SI2 clarity G-H in color. A fabulous platinum diamond semi mount. Platinum Baguette diamond semi mount. Baguette diamonds total 1/2ct tw and are SI 1 clarity G-H color. Center diamond not included. 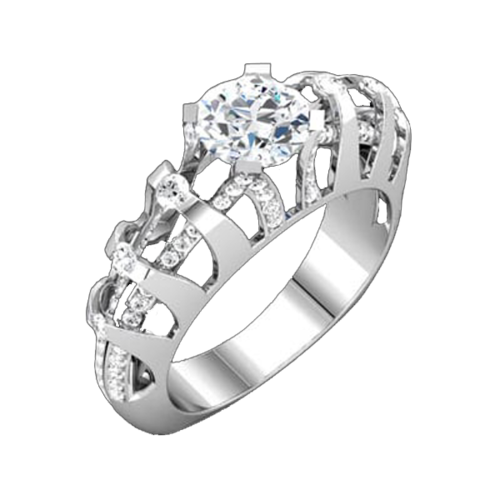 Ring will hold any shape or size center, use our request for pricing. We have an incredible loose diamond selection. Ring available in any metal. Pretty Platinum diamond semi mount. Triple row bead set design set with center row Baguettes and round diamond on outside rows. Diamonds total .45ctw and are SI 1 clarity G-H color. Center diamond not included. Ring will hold any shape or size center diamond, use our request for a diamond price list. We have hundreds of certified conflict free diamonds. Platinum Pave design diamond semi mount. Diamonds are SI 1 clarity G-H color and total 3/4ct tw. Center diamond NOT INCLUDED, shown as 1 carat. We have an incredible selection of loose diamonds perfect for this ring, use our request for pricing. Any size shape center available in this ring, additional metals 14k, 18k, Palladium. Lovely Platinum Diamond semi mount. European (not round, squared at bottom) design shank features bead set diamonds totaling .38ct tw. Diamonds are SI 1 clarity G-H color. Show with a 7x7 Princess cut center diamond (NOT INCLUDED) but we have a huge selection of certified loose diamonds perfect for this ring. Use our request line for a price list be sure to mention item #. Combining fine quality gemstones and platinum, Gracious Rose ear studs and earrings turn heads. We're committed to the highest standards of social and environmental responsibility—and definitely to the satisfaction of our customers. We offer unique and intricate designs perfect for any occasion. Times are changing; the days when watches were the only accessories men wear are long gone. Men now love and rock jewelleries. You can load up with Gracious Rose classic diamond studs that will match your outfit for any occasion. These studs are as simple as they are daring. They suit any face shape and unlike large, garish pieces, these platinum studs won't overdo your style. These are vibrant platinum diamond studs—4 mm in diameter, ¼ carat each, 4-prong basket style, with friction earring backs. Gracious Rose's platinum stud earrings are handcrafted from the finest material to give any man the polished look women always admire—all for a reasonable price. And, if you're unsure of what to buy, our certified jewellery consultants are always there to help you. Platinum's shine has always conveyed simplicity and sophistication. With our wide variety of unique designs, we're sure to have the perfect accent for your style. Whether it's small stud for everyday wear or a pair of stunning drop earrings for evening parties, these will turn heads and leave a lasting impression. Know the shape of your face and what suits your hairstyle best with our jewellery consultants. Gracious Rose earrings may also be the best birthday gift for a classy woman. You may opt to set any birthstone or the gemstone of your choice with our platinum earrings. Enjoy a safe, convenient online shopping experience with Gracious Rose. Our jewellery consultants can help you choose from over 3,500 custom pieces and sophisticated designs. Get the stunning jewellery you've always dreamed of. Gracious Rose jewellery is the perfect gift for weddings, anniversaries, or just to make someone feel special. Platinum earrings go perfectly well with other unique pieces from our wide selection of platinum necklaces and bracelets. You can now get any piece of jewellery delivered to your home for free shipping on orders of $250 and over in 3-14 working days. If you need custom engraving; for overnight deliveries or other options not highlighted in the product description, you may place a special order. Get free advice from our jewellery consultants. Shop for the perfect gift, get Gracious Rose designer platinum earrings.